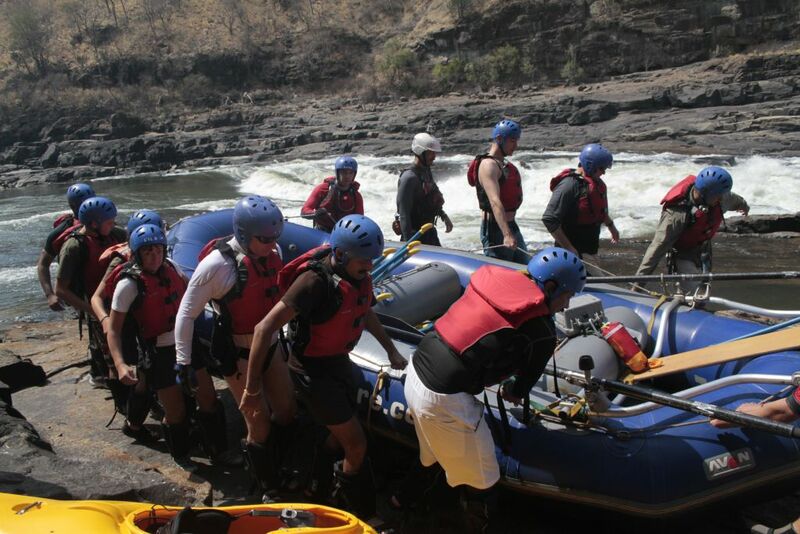 If you don’t know your ‘Stairway to Heaven’ from your ‘Creamy White Buttocks’, this we hope will give you a rundown on the Zambezi whitewater rafting rapids featured on a multi day trip to Ghostrider in the low water season, when the rapids are at their biggest from August until November. 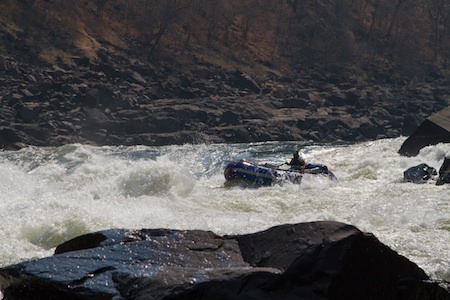 The Zambezi Rapids were originally run by Sobek in 1981 where they ran all the way to Matetsi River mouth. 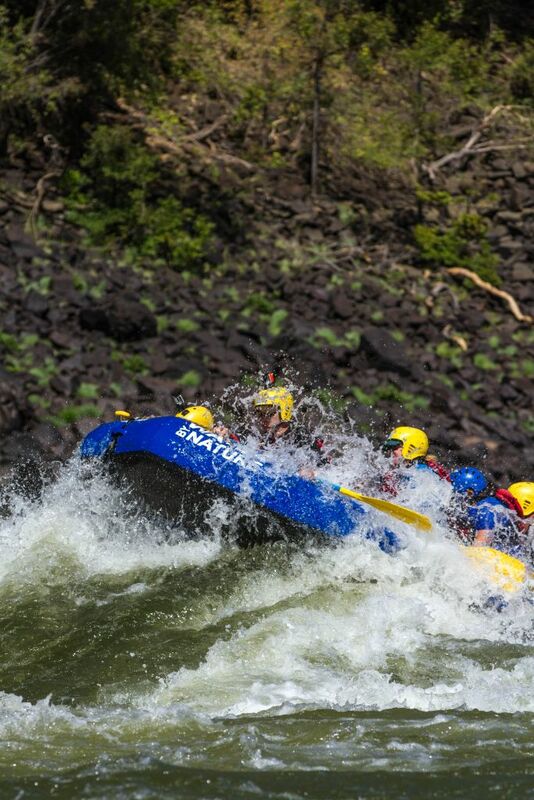 Whilst some of the rapids were named, the pioneering team felt there were so many rapids, that they were originally numbered. The Zambezi rapid number is on the left before the name and then the river grade, beside that. The Boiling Pot: The area beneath the Eastern Cataract of Victoria Falls below the ‘minus’ rapids where you can view the falls from beneath. A flat pool where we start our multi-day Zambezi trips from. What a place to start rafting. 1.The Wall: (Grade 4)This rapid presents a challenge to cross from the starting eddy. A series of large waves all pushing into a wall. Rafts depart high up the eddy keeping a strong 45 degree upstream angle to cross the river and paddle in below the bunny bridge. 4. Morning Glory (Grade 4) A large fun rapid with a variety of lines depending on the level. 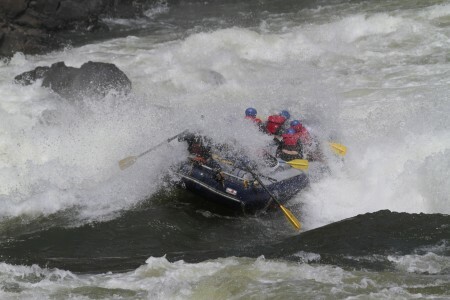 A far right line at the top requires a strong paddle away from a large hydraulic at the bottom of the rapid on the right. 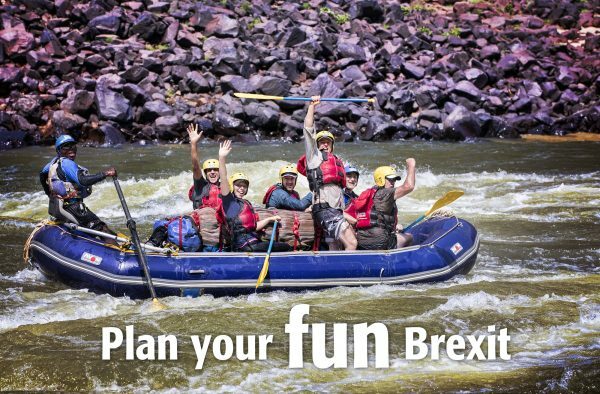 Alternatively you can paddle a raft down ‘dragons back’ between two large holes giving the raft a better line at the bottom of the rapid. In higher flows crew will start left and try and stay left. 5. Stairway To Heaven (Grade 4+) A very impressive rapid which has a wonderful horizon line at the top. On the right side of the rapid is a large pour over and on the left an equally steep drop. Guides line the raft up on 3 ripples in the middle of the rapid before dissecting between the pour over and drop. Hold on and smile! You’ll drop into a large feature called the ‘catchers mitt’ and then the guide will angle the raft slightly to take in the waves coming from the right side. 100% fun! 6. The Devils Toilet Bowl (Grade 3) A relatively straight forward rapid with two large waves one after the other. 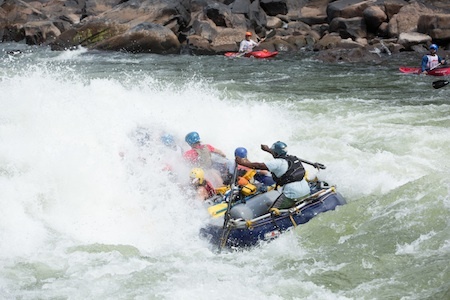 These can surge so guides often get crews to paddle aggressively through this rapid. Safety kayak and cataraft will be waiting below on the right side of the river. 7. Gullivers Travels (Grade 5) A large and long rapid providing the first challenge of your day. This rapid can be viewed from above where we get a clear view of all the features. Head right of ‘indicator rock’ and onto the Green Highway. Here you’ll line up for ‘Directors Wave’ which pushes you left towards ‘The Crease’ and down into ‘Land Of The Giants’. This rapid has a wonderful string of fun-filled features. 8. The Midnight Diner (Grade 3- Grade 4+) : A spectacular rapid which offers 3 different runs in it for all levels. The right side is a technical boulder dodging run, the middle offers big waves through ‘The Muncher’ or you can take on the large drop to the left of the rapid through ‘Star Trek’. 9. Commercial Suicide: A Grade 6 rapid that is not rafted. Occasionally kayakers paddle this rapid. Large features include a massive whole top and bottom, as well as a rocky outcrop on the right side of the rapid. A short carry of around 100 metres. 10. The Gnashing Jaws of Death (Grade 3): This rapid is not as scary or difficult as the name suggests. A couple of features to miss left and right with a large green tongue running from left to right. Great fun wave train. 11. Creamy White Buttocks (Grade 4) Otherwise known as the Overland Truck Eater, this rapid is a very photogenic. A large green tongue leading into whitewater. The line is left, pointing slightly right into a big wave coming off an island in the centre of the rapid. 12 A, B & C (Grade 3): The Three Ugly Sisters: A set of rapids leading into the Mother. Start off with paddling through a large wave on the right side of 12A into a boil section after the rapid. 12B offers a fun wave train in the middle, the top wave flips boats at low flows, but can be easily avoided. !2 C, straight forward and then…. 13. The Mother (Grade 4) This rapid is the epitome of big water fun. With the river wanting to push you right after 12C crews paddle towards the left side of the river and straighten up for the first wave angled slightly right, followed by a series of five waves coming straight afterwards. 15: The Mother (Grade 4): A straight forward centre to right move into the eddy on the right hand side of the river. This helps avoid a large hole in the middle of the river. 16A and 16B, Terminator I & II (Grade 3): These rapids are much bigger in high water. In the traditional low water runs they are fairly straight forward. 16 A involves running left or right of the island, whilst 16B is a wave train which can be quite large at high levels. 17: Double Trouble: (Grade 4) A similar rapid to Rapid 15 but with 2 features in the middle of the river. At certain flows it is possible to run both features but when the river drops lower, both features should be avoided. 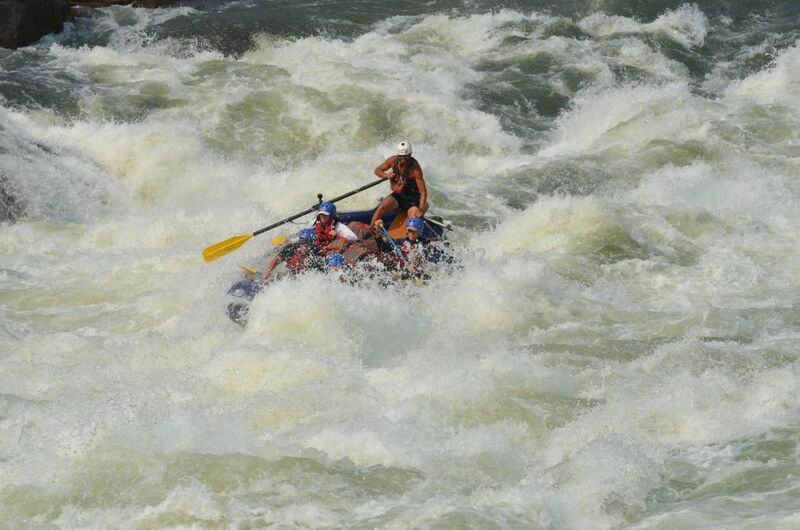 18: Oblivion (Grade 4) Probably the most famous rapid on the Zambezi, this rapid is a lot of fun. Relatively straightforward in higher water, when the river drops lower, the 3rd wave turns into a BIG wave that can surf and flip rafts. Bear in mind, this can be easily avoided as well. 22. Morning Shave (Grade 3) After camping just upstream at Bobo Beach, your first wake up rapid is a splashy little number as you hit the morning Zambezi sunshine. 23. Morning Shower (Grade 4) A brilliant rapid. Start centre and follow the wave train around the left side of the rapid before moving right. A large wave will ensure you are all cooled down. The river flattens a little here with some fun Grade 3 rapids. Closed Season (Grade 3) A technical rapid where paddlers will have to move from centre left, towards the left and then dissect two river features either side of you. 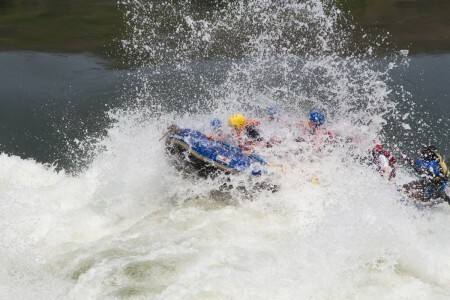 For a more exciting run your guide may take you through a large wave in the centre of the river. Open Season (Grade 5) You will hear this rapid well before you see it. Guides will get out and ‘scout’ the rapid on the left side. The general line is through some shallow rocks in the centre of the rapid moving left and then back to the right to avoid a large hole on the left side of the river. Narrows One (Grade 3-5:) As the name suggests the river Narrows here and rapids are formed by constricted water flow. 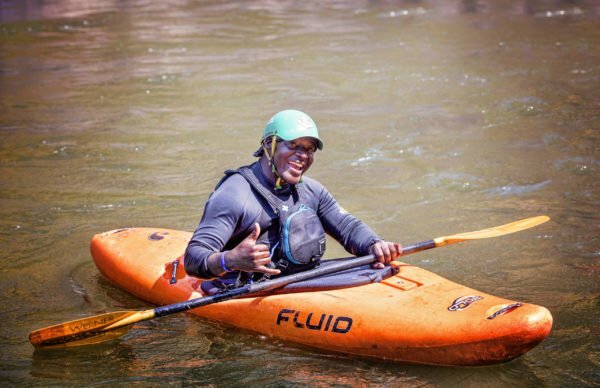 Fairly easy in normal low water flows, this rapid can be intimidating in higher water. Not because it is particularly difficult, but due mainly to the large whirlpools that are best avoided. Narrows Two (Grade 3): This rapid is 100% fun. A series of amazing waves for around 200 metres around a right hand corner. Guests love this one! Narrows Three (Grade 3): A large left bend in the river. Stay right to avoid the pour over on the left and then enjoy the fun wave train all the way down the right hand side. Narrows Four (Grade 3): A technical rock garden style rapid. Make sure your guide doesn’t take you into ‘beer eddy’ or they’ll be buying! 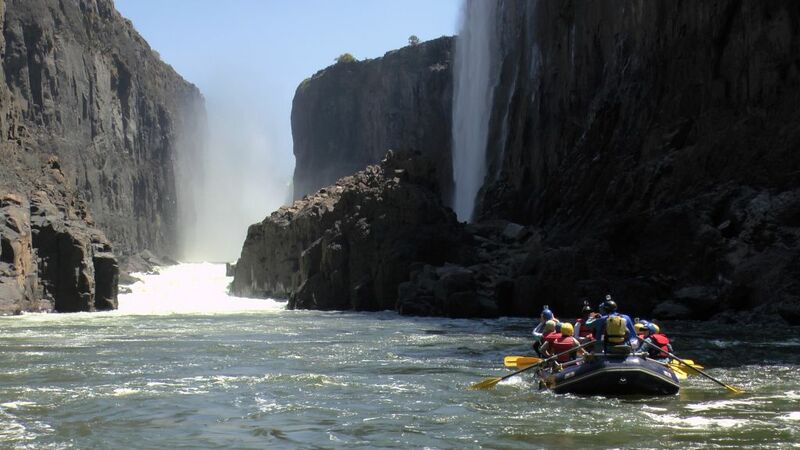 Chamamba (Grade 4-5) Right before you get to this rapid, you’ll have your only following tail wind on the Zambezi. Enter through a narrow hidden channel on the right side of the river before paddling through some large waves on the left side of the river. The river flattens before the final drop over the horseshoe fall where your guide will run you left. Upper Moemba Grade 5: Pure fun. The last rapid before you reach camp for the evening. The river splits here and your guide will run you through the ‘easy line’ on the right side. They’ll line up on a shallow rock just under the surface on the left side of your raft and then be prepared to be slapped with 4 massive waves filling your raft to the brim with water. Lower Moemba Grade 6: A certain portage. In medium to higher flows guides may line (attach ropes to the front and back of rafts) to get it over the drop. Very impressive to see. Chabango Falls (Damsite) Grade 6: Only carrying will do here. You’ll see why. 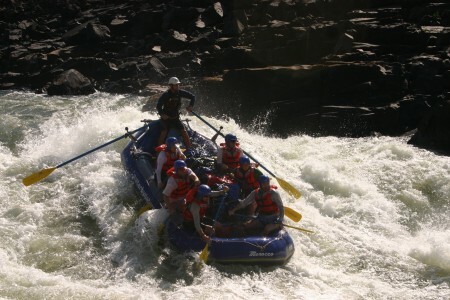 Ghostrider (Grade 5): The biggest and best rapid on the Zambezi River. Class 5 big water at its best. Three enormous waves where rafts disappear behind only to re-appear on top of the wave. The move is to run from centre to the right running all the waves square! This rapid is worth the journey! If you are heading down on a 7 day Mighty Zambezi trip, there are plenty more rapids from here to the take out at Matetsi. 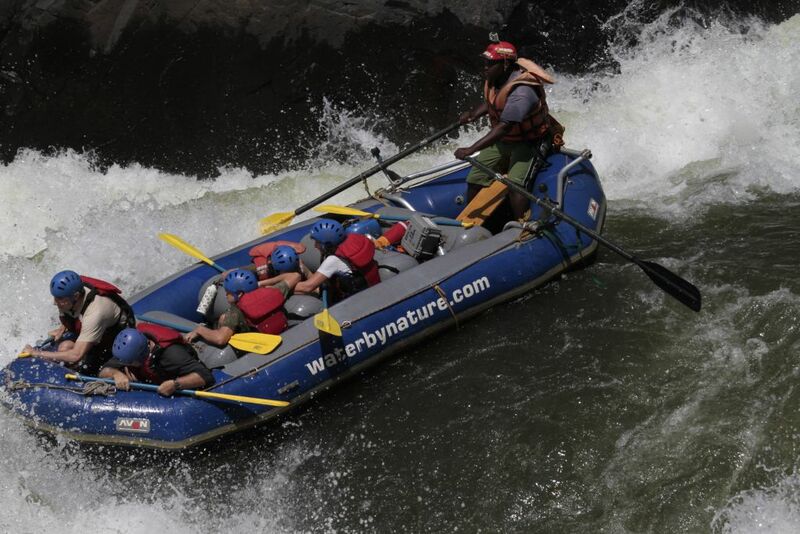 The Zambezi is a wonderful and fun filled adventure from start to finish. 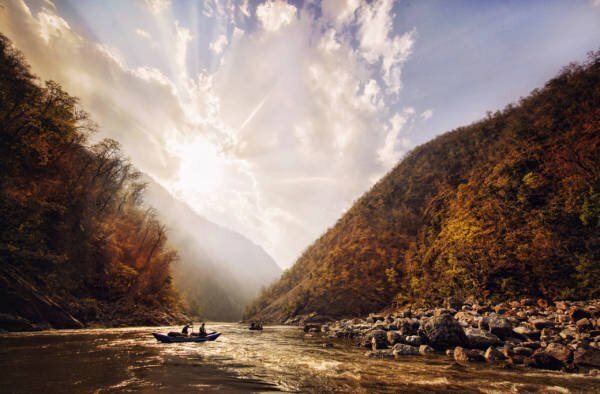 Enjoy some of the best whitewater rapids in the world.